It can be difficult to find pesto sauce at the supermarket that does not contain dairy. In case you’re unfamiliar with pesto, the classic recipe is very simple: basil, garlic, pine nuts, olive oil, Parmesan cheese and salt. Many chefs take liberties with the basics, adding spinach, walnuts or almonds, and even sun-dried tomatoes, for example. 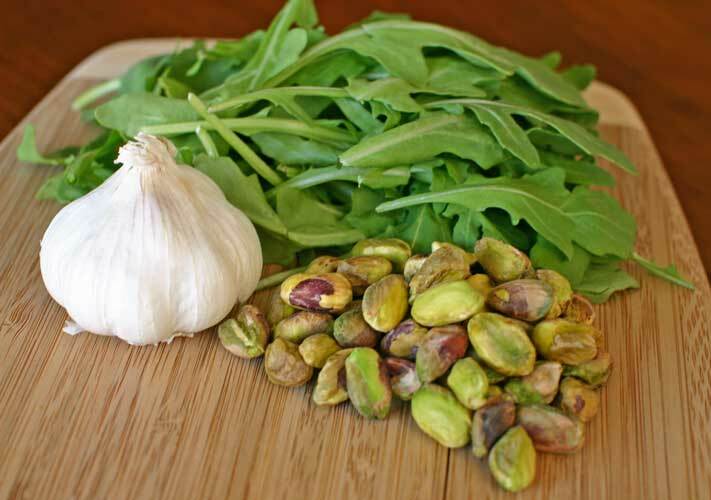 I’m not the first person to try this less common substitution of pistachios and arugula; however, the recipe below is my own. I’ve kept a bit of basil in there, too, but the arugula gives it an excellent peppery flavor, and the pistachios add a tempting richness to the mix. 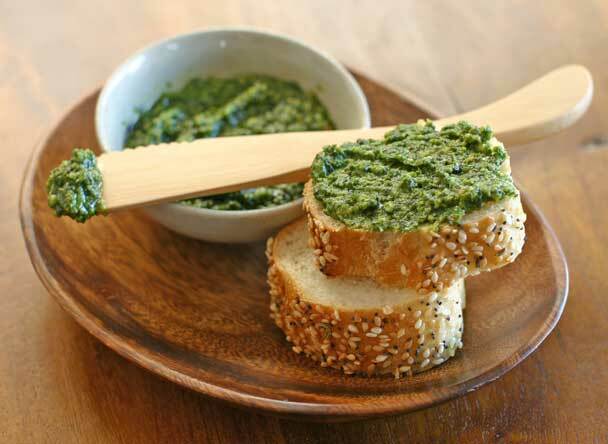 Pesto is traditionally made by grinding the ingredients by hand using a mortar and pestle. Uh, yeah. I recommend using a food processor. If you don’t have one, a blender will also work, but the food processor is a lot easier because you don’t have to keep stopping to push everything down into the blades (as much). It’s always important to use UNREFINED oil in your food preparations, and of course the olive oil in this recipe is no exception. Why are refined oils bad? To summarize, the major problem is that in the refining process the oil is heated at a very high temperature, and so the unsaturated fatty acids it contains are transformed into trans-fatty acids. Researchers have found that these synthetic fats cause cholesterol to build in the arteries in a manner similar to saturated fats, and contribute to arthritis, cancer and heart disease. If you then proceed to fry or bake with your refined oil at above 320° F, more trans fat is formed. Additionally, refining strips the oil of its vital nutrients*. Refined oil is so pervasive that the unrefined variety can be difficult to find, even at health food stores. Clear, unclouded, tasteless vegetable oil that has a long shelf life has become a standard of perceived quality, but the very opposite is true. Unless the bottle explicitly says “unrefined,” then it has been refined, even if it is organic, even if it is “extra virgin,” and even if it has been “expeller pressed.” On a recent trip to WholeFoods, I looked at every bottle on the shelf, and found only one brand (Montebello, pictured to the left) that specified in the ingredients that it was unrefined. You can also order Spectrum brand unrefined olive oil from Vitacost or a variety of unrefined oils from Mountain Rose Herbs. 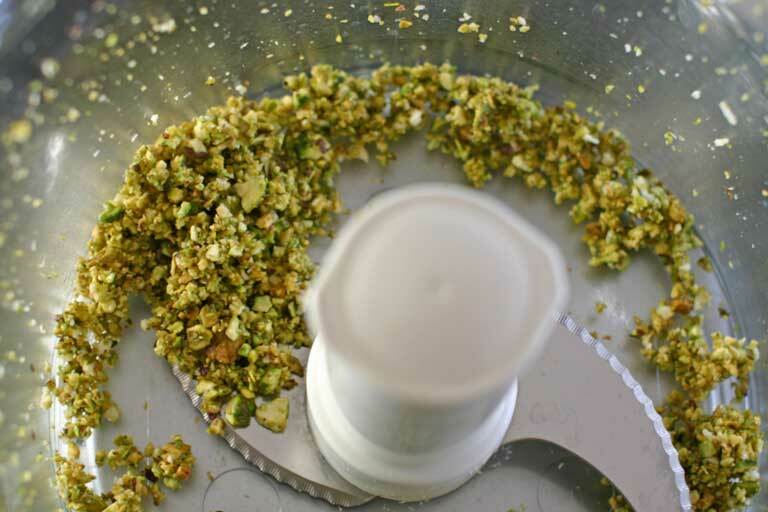 In a food processor, pulse the pistachios, garlic and sea salt into a relatively fine crumble (see photo below for reference). You may need to scrape down the sides a few times to make sure that everything gets chopped evenly. Add the arugula, basil, lemon juice and olive oil, and blend until mostly smooth. Again, you may need to scrape the sides periodically to make sure everything is incorporated. Add the ground pepper and blend again. Taste and adjust the seasoning to your liking. Makes approximately 1 cup of pesto. You can store your prepared pesto covered in the fridge for a few days, or you can freeze some for later. My favorite tip for freezing pesto is to dole it out into an ice cube tray. That way when it comes time to defrost it, you can thaw only what you need and put the rest back. This is really tasty spread over a slice of artisan bread. You can also toss it with some buckwheat soba noodles and grilled or steamed veggies for a healthy vegan pasta dish. Or try my delicious Pesto-Stuffed Mushrooms! 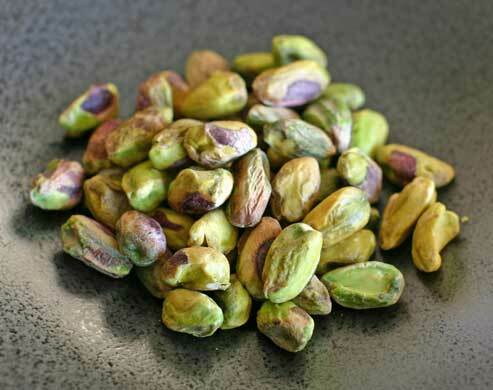 Pistachios are an excellent choice among nuts, because along with almonds they have the highest amount of protein (6g) per ounce while containing among the lowest amounts of saturated fat (1.5g; only hazelnuts and walnuts are slightly lower at 1g). They are also a good source of potassium, thiamin and Vitamin B6, and are known for their free-radical-fighting antioxidants. Arugula, also known as rocket salad, provides Vitamins A, C, K and folate. 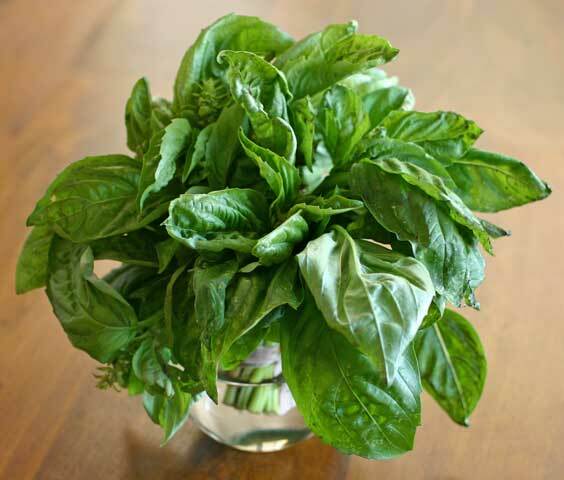 Basil is another good source of Vitamin K, as well as iron. Garlic is strongly anti-inflammatory and is known for its anti-bacterial properties. It contains manganese, Vitamin B6 and Vitamin C, and has also been found to help reduce high blood pressure and other circulatory conditions. Olive oil is a source of Vitamins E and K, as well as omega-3 and -6 fatty acids. It may lower your total cholesterol and therefore your risk of heart disease, as well as helping to normalize blood clotting. 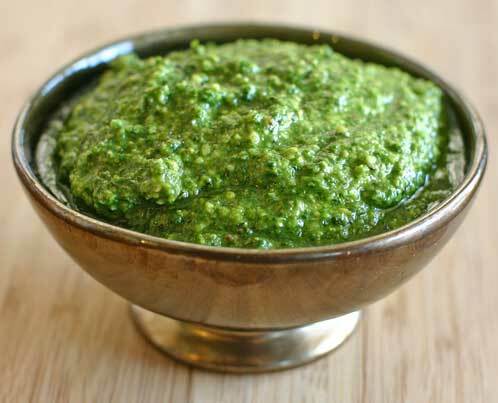 6 Responses to "Pistachio Arugula Pesto"
What a super blog post Stefanie! Thank you. I can picture how satisfying this recipe is, with that sharp arugula balancing out the rich pistachios. Regarding the olive oils, I found surprisingly that Trader Joes carried two unrefined olive oils, or at least they used to. I don’t know that I scrutinized them very closely though. I do remember the cloudy appearance and satisfyingly distinctive flavor. Another good place sometimes is farmers markets. Fresh and Easy has unrefined olive oils. They are the tall dark bottles that are region specific (Spanish, California, etx. ), but check the back to make sure. I made this for my family and we all absolutely loved it, as a matter of fact I will be making some more today. Thank you very much for this wonderful recipe! Tasty, thanks for the recipe!